I am a fan of Fareed Zakaria. So, when I saw an article not just criticizing, but insulting his Global Public Square (GPS) special on saving America's healthcare system, I was taken aback. I was further disappointed when the author did inappropriate things like speculate and imply insults, slights, etc. For example, "he implies that conservatives are nutty and misinformed". Comments like those were the ones I felt crossed the line from critique to insult. However, being a fan of getting at the truth of the matter, I decided to try and evaluate his objections. I picked what I thought was a simple one, the validity of citing life expectancy as a metric for the quality of healthcare, something the critic feels he has thoroughly debunked. Life expectancy is a very commonly-used metric for the quality of healthcare in a country, as is infant mortality. Fareed did not cherry pick those facts, it is established as reasonable and expected. But let's examine the question - is life expectancy a reasonable number in this context? Fareed's critic points out that people die for non-medical reasons. Some, perhaps many, would suggest that any death is ultimately related to medicine because one's ability to avoid dying is typically strongly tied to the ability to get adequate medical care in a timely fashion. Even when one is shot, a resulting death may still be due to poor access to healthcare. Let's see if we can stop there and make a reasonable observation. Suicide data could easily be argued as part of the problem, given lack of access to therapy, etc., but I'll throw that out to avoid controversy. So, let's just take the top nine causes of death, which I hope we can all agree, being due to diseases, are likely related to our healthcare system's quality. Just those nine total to 1,801,602, or 74% of the deaths, far and away a huge majority. Now, I would be pretty content to stop there and say that life expectancy is a fine relative measure and move on, but let me speak more on the relative aspects of it. You see, every other country is being judged in the same way. So, they also have people dying in various ways that one might not attribute to healthcare. And made the simplistic statement that if your country is wealthier, then you have a higher life expectancy at birth. On the contrary, it looks more to me like the USA, which is at the top for wealth has a stunning amount of competition for life expectancy from countries with a small fraction of its wealth. 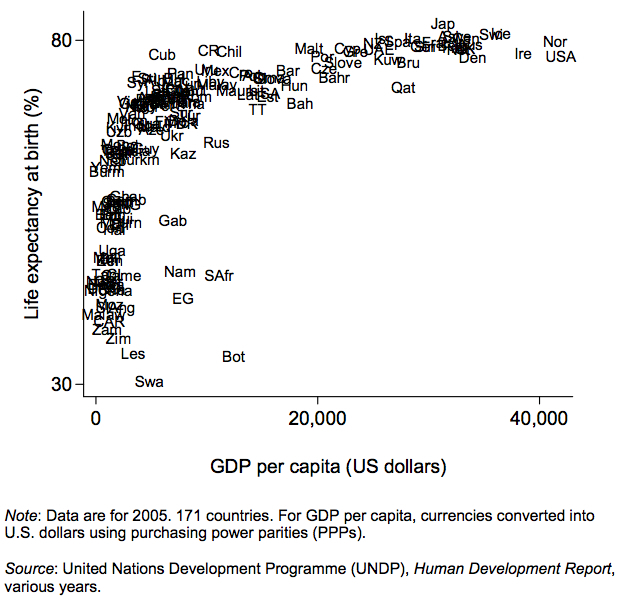 Note: it's GDP per capita, so this is not a big vs. small country thing, it's wealthy vs. poor. In fact, once you get to about 1/3rd of US wealth, there is not a lot of deviation around the USA baseline. In general, I found the critique to be clumsily misleading and I expect better. The more important point, to me, was that this is just one of many tiny points the critic makes. Some of his points may even be 100% correct, but he has delivered in a way that reeks of the kind of commentary you expect from not-so-subtle opinion commentators with clearly partisan agendas. Time Magazine Article "Health Insurance is for Everyone"
At the very least, it is a very thought-provoking view. He also has podcasts of this GPS shows and specials.